I'm just going to park it here as it comes. Why aren't 90% of the guardsman guardswomen? Surely the amount of boys being killed to make space marines should create a gender imbalance. Gue'vesa should be the link between chaos and the Tau. I'm not necessarily saying that we should be seeing chaos Tau but maybe chaos human insurrections within the Tau sphere. Elves from myths are Eldar that have come out of the webway and done some spiteful stuff to early humans. Where are the Indian mythos marines? (I have some ideas for chapters along these lines - for a future discussion). Does the new big warprift significantly weaken Abaddon? Chaos mortals in the eye no longer need to back the big push to have a chance to cause mayhem. How many heresy marines still live in 40k? What sort of % do they make up of all traitor marines? PDFs on worlds where the Space Marines recruit sure, but none of the "archetype" guard regiments come from worlds where the Space Marines are stealing the prepubescent boys. Rob P wrote: Gue'vesa should be the link between chaos and the Tau. I'm not necessarily saying that we should be seeing chaos Tau but maybe chaos human insurrections within the Tau sphere. Rob P wrote: Elves from myths are Eldar that have come out of the webway and done some spiteful stuff to early humans. I'm on board with this, if the Dark Eldar are the closest we have to pre-fall Eldar society then it is clear that the Eldar were dicks. Rob P wrote: Where are the Indian mythos marines? (I have some ideas for chapters along these lines - for a future discussion). Rob P wrote: Does the new big warprift significantly weaken Abaddon? Chaos mortals in the eye no longer need to back the big push to have a chance to cause mayhem. He isn't the only game in town, that is for sure but arguably there are more Chaos worshipping mortals about nowadays to recruit from and his main enemy isn't on the surest footing. If the Imperium has been weakened more than Abaddon has (and Abaddon has millennia of experience of getting renegade warbands to do what he says) then it is still a net gain. Rob P wrote: How many heresy marines still live in 40k? What sort of % do they make up of all traitor marines? I imagine they make up the majority of the ones still going under old Legion names, The Iron Warriors, the Night Lords, The Thousand Sons, Word Bearers etc. The Black Legion I feel are probably more active in recruiting than others, the World Eaters and Emperor's Children don't really function as legions any more and Warbands will recruit any renegade marine they come across and barter with Bile (or one of his former students who have set up competing enterprises) for new stock. I've got plenty of ideas for Indian style marines bubbling. I'm just trying to make them coherent enough for an index astartes. I'm drawn by the ethos in mind, but need to figure out how to make it shift into a viable narrative. I also need to ensure that it's not a straight offensive lift from a religion or something. I'm not sure if it was Robbie MacNiven himself, or the FW writers, that gave the Carcharadons very heavy Maori trappings, but I think it worked very nicely. (In slight contrast to Peter Fehervari's Confederates which felt a bit too on the nose in an otherwise incredible novel). Similarly, I'd really quite enjoy some Central American and non-Chinese, non-Japanese Asian cultures get a look in too. To whit: I'd be very keen for some Indian Marines. I've got Borges' Encyclopedia of Imaginary Beings, I might mine it for some unusual ones that would make good Skitarii Legions or Space Marine Chapters. The issue with Indian Marines in some respects is the diversity. India is wear several world leading religions originated, it is massive and is populated amd varied. Depending on how you count it Indian schools of philosophy number 13 to 17. Which makes appropriating things harder because there is a lot more to choose from conpared to the (comparatively) more mono-cultured Western civilisations. Does one just pick and choose elements from everywhere because some things may not work together easily or do you focus on one specific thing which ignores other aspects? The third way would be to Salamander it and have the companies be divided based on the culture* of the hive they draw from (I alwaysbthink we gloss over non Deathworld recruiting of Marines and something about this screams Hiveworld based). This could lead to some IMHO cool bits, the veteran Deathwatch Commander pleased to see another marine from this chapter with fond memories of the last realising that the marinea couldn't be more different, almost as if they were from different Chapters. *I know the Salamanders are more geographical than cultural though some sort of philosophical conflict would lead to more Drama. Also state why the Chapter Master comes from the Firedrakes not another Company Commander because only the Firedrakes get the real hands on appreciation of the other Salamander companies. The Indian sub-continent has many cultures spanning a massive period of time. It's potentially the equivalent of taking Europe from the early civilisation to date and trying to make a chapter around that. The bubblings of ideas that I have are mixed and not focussed on one society or religion. I believe that the (up to) 10,000 years lifespan of a chapter allows for development and change to. I sort of like the distinction within a chapter via company (not a million miles from Iron Hands before they get pulled back full codex), but more nuanced and subtle. The problem I have at the moment is that I like the concepts and i'm working to apply them to a narrative. - The immortal everchanging soul (jainism) vs the lack of self (buddhism) - Potentially for schism and reconcilliation? I'd also like to see something nearer to the Space Wolves understanding of chaos, but not sure about that yet. I have another few things bubbling in there. For example, if they loosely followed the caste system of leaders (not necessarily the spiritual sort for this), soliders, then everyone else - you could have a sister Astra Miliatarum (i.e. drawn from the same world as space marine recruits) regiment with a command that outranks the line space marines. This could create a point of conflict. I suppose the other aspect to consider is the extra marines that float about in a Chapter and their relationships with each other and the chapter. Thinking the Techmarines, the Apothecaries, The Chaplains and the Librarians. The Space Wolves for example have conflated the Chaplaincy and the Apothecary in their Wolf Priests, in the Silver Skulls many of the traditional roles of the Chaplains are performed by a specific class of Librarian. Could it be that this chapter has distinct roles that blur the lines between these either as well as the traditional Chapter organisation ones or replacing them. Two types of Chaplain may make it easier to engineer some of the thoughts you have (as well as making a new type of Marine character who will undoubtedly be awesome). I am really loving the notion of an integrated Caste system between the Chapter and the world, the notion that this is a Chapter that rarely if ever deploys solely as an Astartes force because it has an integrated personal quasi-Guard regiment on hand. 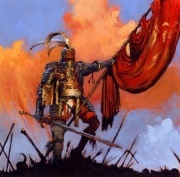 The notion that some Captain at the end of the Heresy whose career hadn't gone great and was mostly babysitting Imperial Army deployments rather than being a proper heroic Captain, gets given command of one of the new Chapters partly because they seem well suited for dealing with the new Imperial Organisations post Heresy, picking a populus hive world because that gives him access to the resources to actually truly function independently of the Imperium and wage proper wars because he'll have men, and weapons and whatever. Well I am in love with it and it is probably nothing to do with what you were thinking it is just where my mind went. Keep me abreast of your developments. I'm still throwing all sorts round. As I say, 10k years allows for a bunch of conflicting ideas. @xisor: sorry, somehow missed your post on first skim. I believe the Maori stuff goes back to FW. It's interesting to have the idea of the development of a chapter that is spontaneous and similar to x nation without saying they're descended from, say, vikings. I'm still at the point where my excitement about the concept is smothering the story aspect. Xisor wrote: Similarly, I'd really quite enjoy some Central American and non-Chinese, non-Japanese Asian cultures get a look in too. The White Scar librarian from A Thousand Sons not doing it for you? Going for orange and yellow for Indian marines. Not unlike fire hawks without flame pattern. Will still look flame-like to the average human in world. A problem with the colour scheme is red vet sergeant helm looks naff.